This is our 80 year old Chocolate Lab, Bailey. OK, she's only 11+ years old, but she's at least 80 in dog years. We have had Bailey since she was 16 weeks old and she has always been a big dog. As an adult, she has always weighed between 80 and 90 pounds. Her dad was 120 pounds and her brother, Lincoln, topped that. Aside from incontinence and signs of arthritis, she's been a great family dog. We will really miss her when she is gone! UPDATE: Bailey is now 91 (she turned 13 on January 26, 2012) and still going strong. That's a pretty long life for a Labrador Retriever. Unfortunately, Bailey suffers with anxiety attacks at night, so we aren't getting as much sleep as we would like to. She has also developed quite a few fatty deposits under her skin, so it feels a little lumpy when we pet her. She sees the vet regularly and he is not concerned. The other big health issue for Bailey is arthritis. The best canine arthritis treatment we have found is a liquid supplement with Glucosamine, Chondroitin, Hyaluronic Acid and MSM. What we use is called NaturVet ArthriSoothe-GOLD for Horses and it is actually formulated for horses. That link will take you to Amazon, which has the best price we could find on the 32 ounce bottle of ArthriSoothe-GOLD at about $40, including shipping. Bailey weighs about 85 pounds and we give her 1/2 teaspoon in the morning and another 1/2 teaspoon at night. We just pour it right on her dog food and then let her lick the measuring spoon (kinda cute). In that small quantity it lasts quite a while. Miracle stuff! Her muzzle has a lot more gray in it now, but she looks about the same as she does in the picture above. We are not looking forward to the day when she is gone. Thanks for sharing your insight on anxiety in Labrador Retrievers. Sadly, our Bailey died about three weeks ago. She was such a wonderful dog with many great memories for our family, friends and neighbors. She touched a lot of hearts and she will be greatly missed. Enjoy every minute with your Lab. We still have three Cockapoos, but the house won't be the same without Bailey. 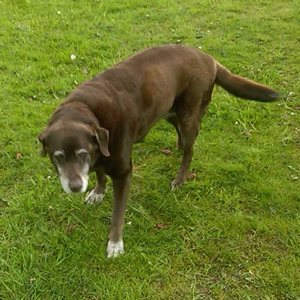 My choc lab, Cadbury, is 13 and a half years old. You mentioned anxiety attacks in the night and your lack of sleep. Cadders had the same problem for about 6 months earlier this year. It got to the stage where I was up with him almost every 2 hours during the night just like a baby! One night I have to admit I got very cross with him and just stood and gave out to him (pointless as he's also deaf!) signaled to him to put his head down, then turned off the light and left him. The rest of the night he didn't make a peep! I realised that just like a baby, he associated a whimper with immediate attention. He tried it again the following night but I just did the same thing. He got the message. Now we make sure he goes out for a wee while we are brushing out teeth before bed so as when he comes back in, it's lights out and don't bother to wake anyone. Of course on the rare occasion when he genuinely needs to go out he will bark but this is now a deliberate request by him and he knows he will be let out. Everyone's getting their unbroken night's sleep again. Try it. I really hope it works.